… I think that The Viking and I lead a pretty healthy lifestyle. Yes, there’s a lot of cake and yes we love to eat heartily but we also exercise regularly and eat a lot of green stuff so I don’t worry too much. One thing we do eat huge amounts of is cheese. We both absolutely adore cheese. Any kind, from your regular block of British Cheddar to the smelliest Camembert we will eat it all day long. Our treat in the evenings are slices of cheese, carrots and celery… or if we’re really lazy, slices of cheese. 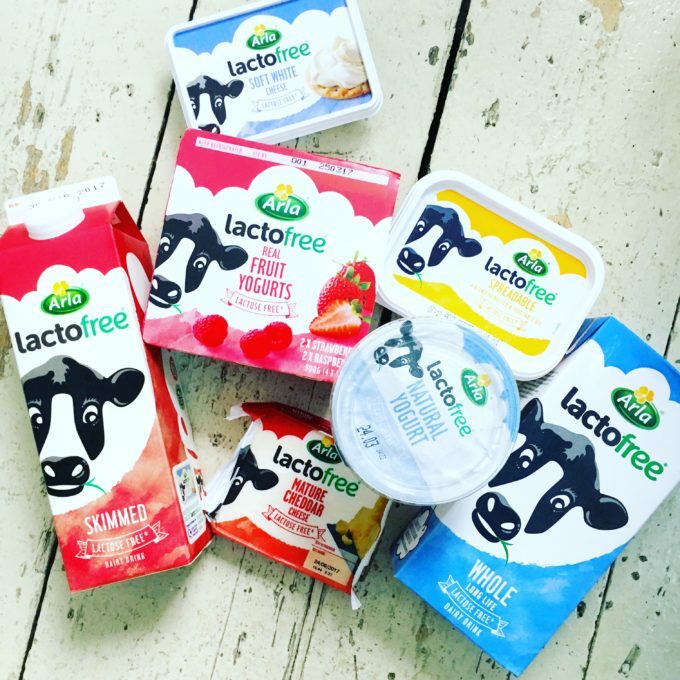 So you can imagine that it came as quite a shock to us when the good people at Arla asked me to take up their two week #LactofreeChallenge which involves replacing my usual dairy products with Arla Lactofree alternatives. Now, you may be thinking ‘what is he talking about?’ because you realise that lactofree dairy is still dairy just with the lactose removed but up until I actually tasted the delicious soft white cheese and then read the actual package I didn’t really have a clue – slapping the forehead kinda moment, I know! The Arla Lactofree range comprises the same classic dairy products you know and love (milk, cheese, yoghurt, cream and spreadable) but minus the sugar lactose, which triggers unpleasant reactions in the intolerant. Basically, it’s an exact match for taste and consistency and can be swapped for the same volume of traditional dairy in any recipe – but comes without the digestive discomfort that bothers people with intolerances. Which is great right? It’s quite amazing that there’s so much choice out there these days and that the choice is of such high quality for both us and the welfare of the cows, which is also really important to me. Now I don’t believe I am but up to 15 per cent of the UK population are thought to be lactose intolerant, according to research published in the American Journal of Clinal Nutrition With common symptoms of lactose intolerance include stomach cramps, bloating and irritable bowels – not nice. We were sent a really generous amount of milk, cheese, yogurt and spreadable and really didn’t notice any difference at all over the two week challenge period, which I guess is really great. My favourite product was the soft white cheese which we managed to get through in one sitting, spread onto crackers and eaten with avocado. We enjoyed it so much that I actually had to change the recipe I was going to cook (a pea and broccoli risotto) with the one below. We also enjoyed the yoghurt and the strong cheddar which was in fact a perfectly delicious replacement for our regular strong cheddar in texture and taste. for this challenge post I wanted to make something ordinary and everyday but with a little special twist that pushed me to explore the products that the lactofree range had to offer so the pesto here is made with the lactofree mature cheddar cheese. It may look like a long process below as i’ve made the pesto and the tomato sauce from scratch but feel free to skip this and use your favourite brand of sauces if you want something a little less laborious! once they’re done, remove and set aside a couple of large tablespoons for the pizza base and then add the tinned tomatoes, wine and stock, turn the heat to it’s very lowest and let them plop away gently for at least 2 hours if not longer. next make the red pesto which is super simple, in a food mixer or a nutribullet, simply add all the ingredients and whizz to a fine pulp – then set aside. once the tomato sauce is ready, let it cool completely and then stir in the pesto – set aside or jar. once the dough is soft and elastic place it into a large oiled bowl, cover tightly with clingfilm and set aside until the dough doubles in size – this can usually take roughly an hour. If you want to reduce stress and make the dough ahead of time simply place the dough in the fridge until you’re ready to use it – it will last overnight. when you’re ready to assemble your pizza, pre-heat the oven to 190C and place either a large baking tray or a pizza stone in the warming oven, then split the dough into two setting one half aside. gently steam your peas and broccoli until just al dente – then set aside. oil your work surface and your hands and place a large sheet of baking parchment onto the oiled work surface. Slap the dough ball onto the baking parchment and begin to spread the dough outwards creating a large rough circular shape. I do this with the ball of my hand, teasing it out gradually but you could be more brave and toss the dough in the air to stretch it, or just use a well oiled rolling pin. The dough will naturally reach a size where it can’t get any larger. 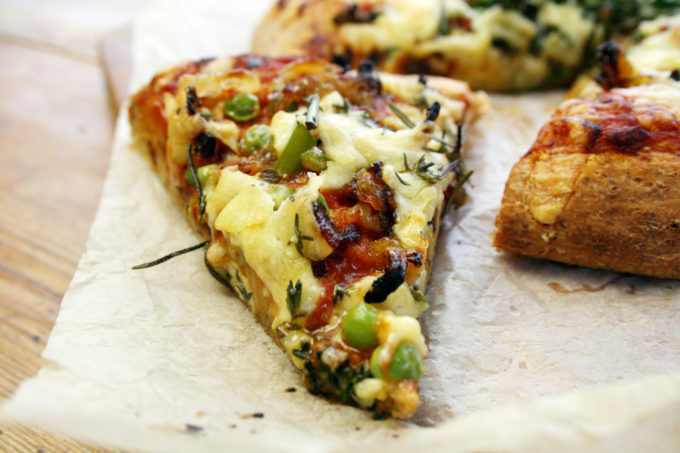 I like my pizza’s with a relatively thick base and crust but go as far as you dare. I made a pesto pizza last week, but sadly it got eaten before I could photograph it…… so sadly it won’t make it to the blog. I’ll just have to make it again!! 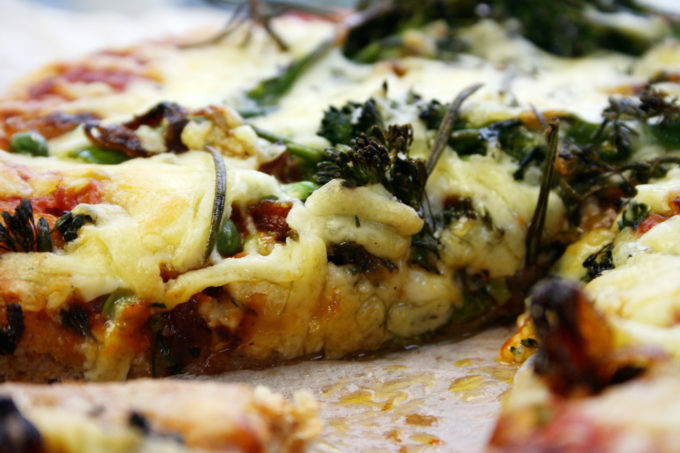 thanks Kate… there’s something about the pesto sauce that makes the pizza taste soon good! 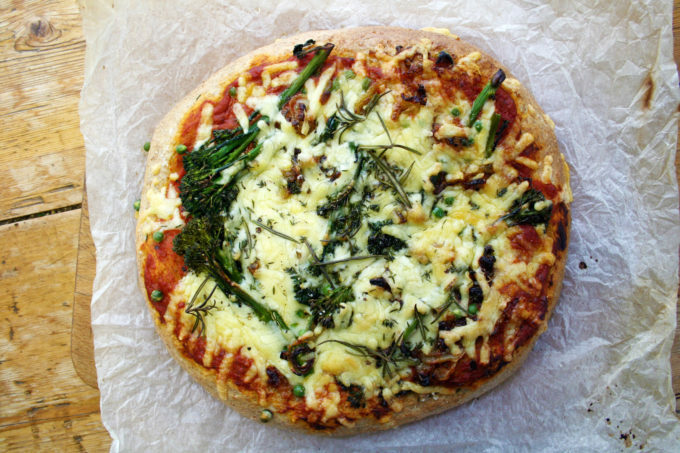 Broccoli on pizza is a novelty for me, I wonder if I could sneak it into pizza for my guys, that would be splendid. I now have a serious craving for pizza, what, with all that oozing cheese. I only ever tried Lactofree spread, didn’t realise they have such a varied range (not that we have problems with dairy). I love your creative toppings on this pizza and pizza is my most favorite dish ever. Lots of cheese, okay! I don’t know if we have that cheese here in the US – I would love to try it. Thanks! We too are cheese fiends, just love the stuff. 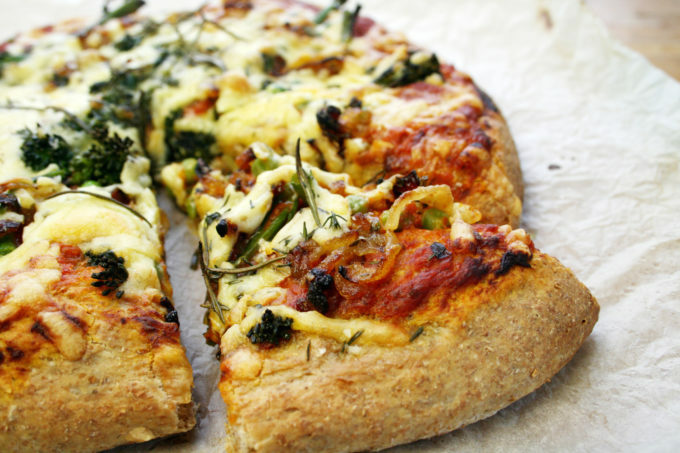 Pizza is a great way to eat it and yours looks wonderful. i know… cheese and bread is the best!